The highly-anticipated trailer for the standalone Joker movie has finally been released by Warner Brothers Pictures and it's absolutely worth the wait. Joaquin Phoenix looks fantastic as expected. The cinematography is topnotch. And the accompanying music is great. After the lackluster Joker performance by Jared Leto in 2016's Suicide Squad, it looks like the character is getting a much better treatment this time with Phoenix under the makeup. The trailer opens with a scene of Arthur Fleck (the Joker) talking to a social worker from the Department of Health. "Arthur, does it help to have someone to talk to?" the social worker asks Arthur. Arthur just looks at her and grins. The rest of the trailer shows how Arthur turned into a life of crime and chaos. He wasn't always an agent of chaos. "My mother always tells me to smile and put on a happy face. She told me I had a purpose. To bring laughter and joy to the world. Is it just me or is it getting crazier out there?" He failed as a stand-up comedian and then he snapped. In pursuit of Arthur is the Gotham Police Department. In the words of one of the cops: "Gotham has lost its way. What kind of coward would do something that cold-blooded? Someone who hides behind a mask." The trailer ends with the following words from Arthur: "I used to think that my life was a tragedy. But now I realized, it's a comedy." Reactions to the trailer are mostly positive, mostly because of Phoenix's portrayal of the famous character. Some are even comparing the performance to that of Heath Ledger. When the trailer was uploaded on Facebook and YouTube, the video quickly went viral in both platforms. Joaquin Phoenix and The Joker quickly trended on Twitter. 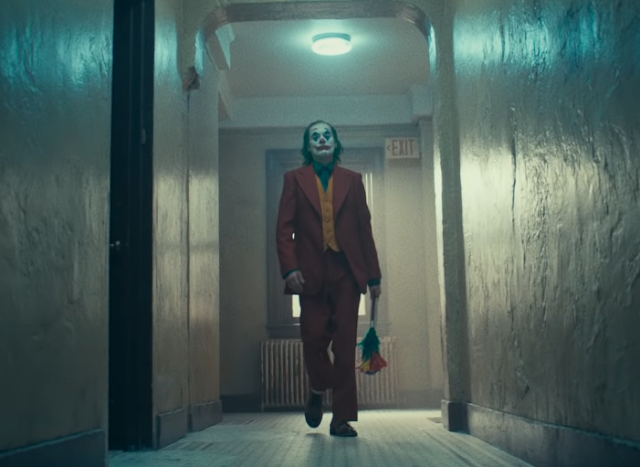 Joker is scheduled to hit theaters in the United States on October 4, 2019. Starring alongside Phoenix in the film are Robert De Niro, Zazie Beetz, Bill Camp, Shea Whigham, Frances Conroy, Brett Cullen, Glenn Fleshler, Dante Pereira-Olson, Douglas Hodge, Marc Maron, Brian Tyree Henry, and Bryan Callen.